On a recent trip to the local library I found a quaint recipe book from 1975. I just knew the pages would be filled with simple dishes made with love. I was right! There are no colored photos here, no fancy, un-pronounceable ingredients, not a single celebrity chef. JUST what I was looking for. 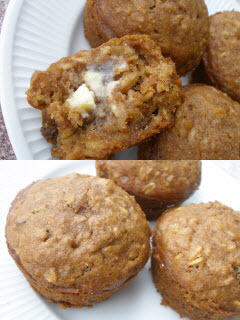 These muffins are a variation of Lorraine Boyce's submission for "Gram's Oatmeal Muffins". I took the liberty of modifying the recipe a bit. Hopefully Lorraine won't mind. 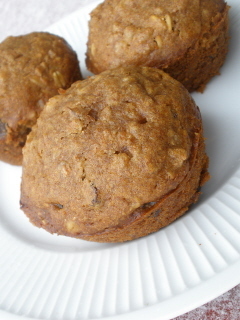 These turned out so moist and not too sweet. If you are a nut fan I suggest throwing in a handful. There are already variations of these developing in my head. Preheat oven to 325°. Boil water. Turn off heat and add oats. Stir in and melt butter and let cool. Add remaining ingredients. Mix well. Bake in greased muffin tin for 20 minutes at 325°. Easy enough? !